The most advanced models of the Earth's climate predict gradual warming of the average surface temperature due to the release of carbon dioxide (CO2) from the burning of fossil fuels. With a good historical temperature record, this warming should be observable by climate monitoring stations. What have scientists observed about the Earth's climate to date? On January 13, 2006, the National Oceanic and Atmospheric Administration (NOAA) National Climatic Data Center (NCDC), the world's largest active archive of weather data, released their Climate of 2005 report. The report contains a number of sobering observations about the Earth's climate: average surface temperature continues to warm; polar ice is melting rapidly; hurricane activity is at a record high; and in the United States, low Northwest snowpack contributed to a period of drought in the region. 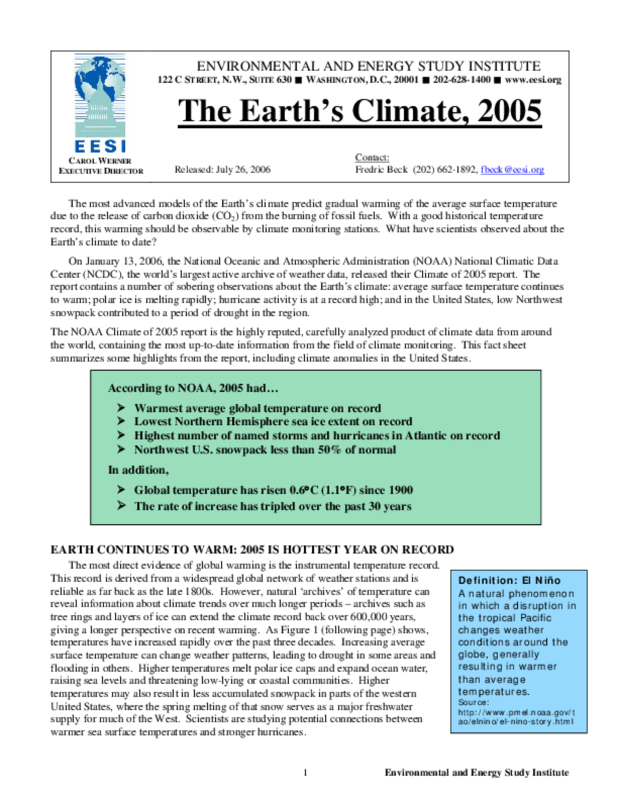 The NOAA Climate of 2005 report is the highly reputed, carefully analyzed product of climate data from around the world, containing the most up-to-date information from the field of climate monitoring. This fact sheet summarizes some highlights from the report, including climate anomalies in the United States.